Piano Tiles 5It refers to one of the most popular genres for mobile devices - a time-killers. 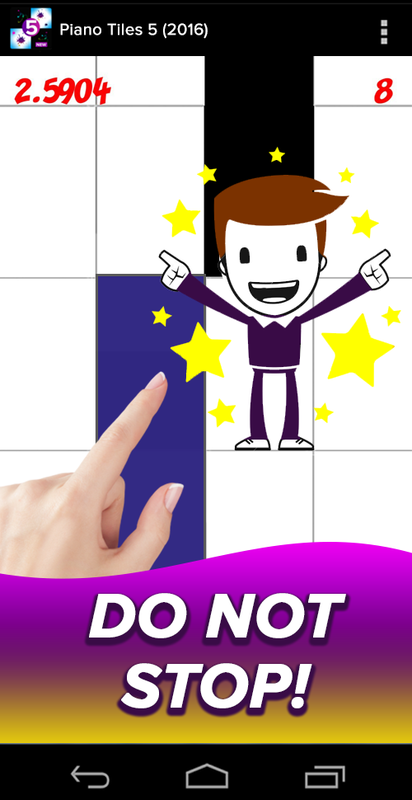 Time Killer - a kind of game where the main task of the player is to timely «Tap-a-tile», that is, pressing the tiles to achieve a some result and the job level. One of the secrets of the popularity of games such as the original Piano Tiles 5, a small load on the processor, system and graphics card, and therefore long play such games have little effect on the battery life of mobile devices.Series Piano Tiles is very popular in Pleymarkete, and the first version of this arcade clicker musically became a blockbuster. The main task, which is characteristic for the entire series of games, is the performance of music by «Tap-a-tile» clicking on the desired tile Black and avoiding the bad press keys white. Inspired by the success of the first four parts, the creators could not please fans of Piano Tiles output of the 5th part of the game. Since entering the first part of the original musically Piano Tiles in 2014 it was replaced by several developers. So, the development of the first part was Umoni studio. However, later the rights to the franchise were transferred Cheetah Mobile, which is known for its love for maximum monetization of their projects. Part 5 was released a new developer yang houkang. To a word, this is his first application developed for android, which has already been downloaded more than 500,000 times. - Jumping - mode in which to hold the ball through an stack, in order to win. - 2048 – try instead of tiles and key figures. Аnd also shuttle, arkanoid, around and many other modes, which are now adapted in Piano Tiles 5. Regardless of which mode is selected, each game brings points the amount of which depends on your level, as well as the game progress. For each game trying to removed one life. Depending on the mode, the player must click on the screen timely, getting on the black keys, or tamper with the ball, numbers, and other objects in the music. And not to touch the white keys and avoid stacks, bumpers and other. The game is played under the selected melody player. Depending on the success and collected points the player receives increasing their opportunities in the game, such as the opening of new melodies. The sound in the game like drawing graphics, very high quality, and exciting gameplay. The game allows you to feel like a virtuoso musician. Present inside buying. But a good game, they are not necessary. Almost all the drawbacks will be noticeable only on cost devices. Since the game is pretty hard graphically, it may cause discomfort during the game on slower models, even while reducing the load on the menu. It is also desirable to have a quality sound speaker in a smartphone or tablet. Fans of classical original Piano Tiles can criticize over wide range of game modes. Piano Tiles 5 — It turned out pretty interesting musical time-killer, becoming decent sequel to the popular franchise. 5th part really quickly replace the previous version on most mobile devices. The gameplay is really addictive and time,spent for the game, it runs quickly and quietly. Installing the game is completely free and it is really worth to try to play on your device.